On Monday, the Trump administration will reimpose sanctions on the Iranian regime's energy, shipping and financial sectors, targeting over 700 entities. Many of these companies were initially hit by Obama-era sanctions that were subsequently lifted when the U.S. entered the Iran nuclear deal in 2015. Three hundred of the entities are new targets. Monday's action will be the most significant move resulting from President Trump's decision in May to withdraw from the Iran nuclear deal. The U.S. was not able to force Iranian oil exports to zero — which was its stated goal. But Secretary of State Mike Pompeo, speaking with reporters on Friday, credited the intense pressure from the administration with driving down those exports substantially. So far, the decrease includes a significant reduction in the imports by China, by 200,000 barrels a day, according to a GAO report on Iran sanctions. "Starting today, Iran will have zero oil revenue to spend on any of these things," Pompeo said, in reference to Iran's support for terrorism, military involvement in Syria, ballistic missile development and cyber hacking activities. "Zero." Administration officials say that Iran is already feeling the impact of the sanctions snapback. Iranian oil imports have cascaded downward in the last few months, since many companies and countries had anticipated the return of these sanctions. "We will, we expect, have reduced Iranian crude oil exports by more than 1 million barrels even before these sanctions go into effect," Secretary of State Mike Pompeo said, which means slashing their current export numbers almost in half. Eight countries will get sanction waivers, though the U.S. will not reveal the list of countries until Monday. Afghanistan, Iraq and South Korea are three countries on the list of waiver recipients, according to diplomatic sources, CBS News has confirmed. Other officials have said the list would include U.S. allies such as Turkey, Italy, India, Japan and South Korea, had made efforts to eliminate their imports but could not complete the task by Monday. The Iranian regime will still be able to import humanitarian goods and other goods and services from the countries that are continuing to import their oil and have been given the exemption from the US. The countries will proactively push their imports down, and they will not be paying for what they are getting in cash, preventing the flow of funds to Iranian proxies in the Middle East, including Hezbollah. "Some of these will take a few months to get to zero," Pompeo said. "We will give them a little longer to wind down. Weeks." 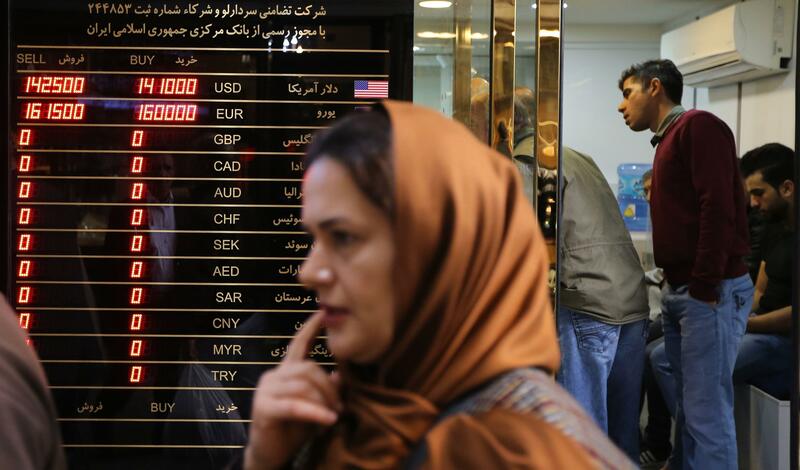 SWIFT, a financial messaging service at the heart of enabling Iranian business, will be subject to US sanctions if it continues to facilitate Iranian oil exports, but it is not among the 700 targets of Monday's sanctions snap-back. "We have advised SWIFT the Treasury will aggressively use its authorities as necessary to continue intense economic pressure on the Iranian regime, and that SWIFT would be subject to U.S. sanctions if it provides financial messaging services to certain designated Iranian financial institutions," said Treasury Secretary Steve Mnuchin. Critics said the Trump administration is now using the very same strategy the Obama administration used: hard-charging sanctions to force Iran to the table for a deal. But ironically Mr. Trump ditched the deal that was in place. Administration officials claimed that Trump is pushing much harder on sanctions and will get a better deal in the end, by not focusing solely on Iran's nuclear program. They also say their approach is much tougher, citing as an example the eight "temporary" waivers, compared the the Obama administration's 20 waivers, according to Brian Hook, the U.S. special representative for Iran. There has not yet been any significant tangible impact of these sanctions on the destabilizing "death and destruction" of the Iranian regime's proxies. The administration expects to see an impact eventually, though they won't put a time frame on it. "We don't expect to start seeing these effects come into effect until later. Our sanctions don't go into effect until Monday," Hook, the US special representative for Iran, told CBS News. "We expect to see more progress as our sanctions start to bite." There are expected to be three phases in the Trump administration's approach here, according to Mark Dubowitz from the Foundation for the Defense of Democracies, which is in regular contact with the Trump administration. Phase one was the maximalist demand of getting Iranian oil exports to as close to zero as possible ahead of November 5 without spiking oil prices. Phase 2 will be denying oil revenue to Iran by locking up these revenues in restricted accounts. Phase 3 would be later in 2019 when the administration assesses oil markets will be more fluid, and global demand is predicted to decrease which might allow the U.S. to move to cut the Iranian oil exports even further. "They don't want all the Iranian oil off the market November 5, because that would spike the price and send additional revenues to Iran," explained Dubowitz. Hook said the U.S. had planned carefully in an effort to avoid causing such a spike. There are other complicating factors in driving down the Iranian oil imports of some countries. A diplomat from one country noted that its systems are build for Iranian crude and importing oil from other countries would pose a challenge because it would mean a costly restructuring of the whole oil processing system.